Here we share some about our journey-both in and out of the woods. On our last adventure, we ran across several specimens of Indian Pipe growing. Indian Pipe is known by several names. Just to name a few : Ghost Pipe, Ghost Plant, and Corpse Plant. Indian Pipe is more commonly found pure white but may have black specks on it and have pink colorations. Rare variants may even have a deep red color. "Before selfishness came into the world, which was a long time ago, the Cherokee happily shared the same hunting and fishing lands with their neighbors. However, everything changed when selfishness arrived. The men began to quarrel with their neighbors. The Great Spirit transformed the chiefs into white-gray flowers that we now call “Indian Pipe.” The plant grows only four to ten inches tall, and the small flowers droop towards the ground like bowed heads. Indian Pipe grows wherever friends and relatives have quarreled. Next the Great Spirit placed a ring of smoke over the mountains. The smoke rests on the mountains to this day and will last until the people of the world learn to live together in peace. That is how the Great Smoky Mountains came to be." 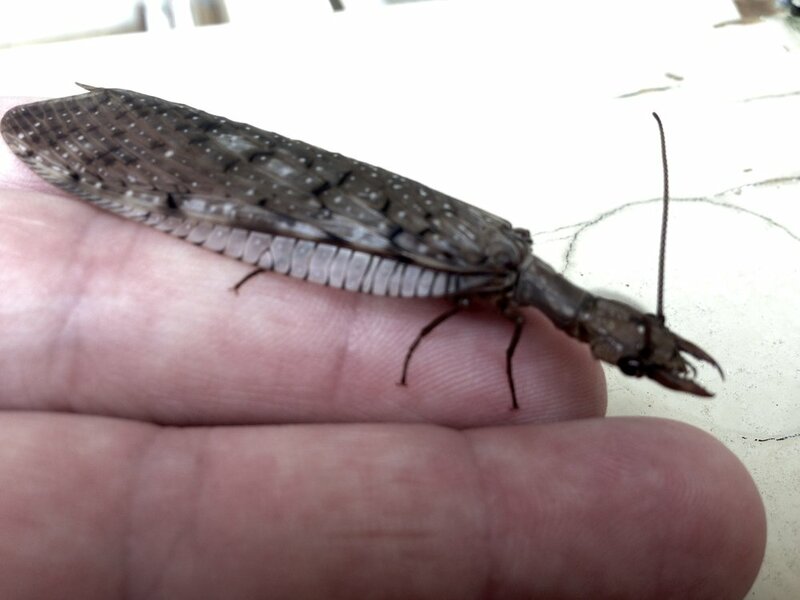 When fully grown the Dobsonfly is also sometimes know by the name Luciferfly. It starts its life as larvae living in streams, creeks, and rivers. At this stage of its life it's known as a Hellgrammite. Once its starts maturing it will come out of the water and grow wings as an adult. This is when it's referred to as a Dobsonfly. The males have very large mandible jaws that look very fierce. While the females have much smaller mandibles. The bite from a female can be more painful than the male and will sometimes bite if felt threatened. Here's a short video of last weeks adventure on the Obey River. Photos of my Appalachian Ancestors, myself and places I've roamed in the Appalachian Mountains. Here on the Cumberland Plateau the Morel mushrooms are sometimes referred to as "Dryland Fish." Morels can appear overnight and are a gift of the early spring woods. I have heard all my life an old saying that says when Oak tree leaves are the size of mouse ears it's time to look for Morels. They can be very hard to spot even to the well trained eye! You have to really key in on what your looking for and it definitely gets a little easier with experience. I've had days when I've walked several miles and haven't found any at all and other days I feel as if I've hit the mother load! Anyone who knows me knows this is my favorite time of year! Morels are often found around certain types of trees depending on what area your from. So I definitely recommend learning the different types of trees if you want to become a seasoned mushroom hunter. Here on the Plateau I like to watch under fruit trees, Tulip Popular ,Cedar, White Pines, Sycamore, Hickory, and Ash trees just to name afew. If your lucky enough to spot a Morel take note of what type of trees are nearby and the area because usually they will grow in the same general area year after year. These mushrooms will not grow unless the soil and weather conditions are just right. A wet and warm Spring is generally a good sign of a great mushroom season. 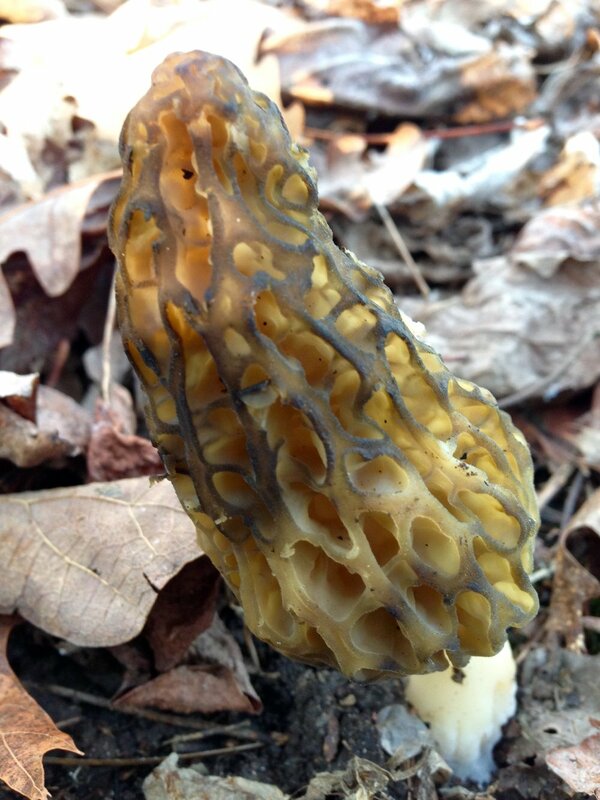 Usually the first Morels of the season tend to be darker and found on the Southward or South Westward slopes because in early Spring the ground in those areas usually seem to warm up faster. Soon to follow you will start finding them in other areas as well. The Morels in the later part of the season tend to be more yellow, white, and grey. The Morel mushroom season is very short usually only lasting 3 to 4 weeks. Some mushrooms are very toxic and afew can be fatal ! So I recommend being 100% sure you know what your doing when gathering any wild mushroom. Even with Morels there is a False Morel that is very toxic and to the untrained eye can be very misleading. (So be very careful and learn how to tell the difference!!! " NEVER eat any mushroom that you aren't 100% sure is safe!